Fantastic! This is definitely worth seeing, as any musical usually is. But there is something about How to Adult that just hits the nail on the head. Set in a co-housing situation in Vancouver, 4 young 20-somethings live together and try to be adults. With a runtime of just under an hour, it will leave you humming the tunes and wanting more. Together these four young millennials write out a list of things they think they each need to do in order to become more adult-like. The list includes things like: getting a job, eliminating co-dependent relationships, and finding community. And added as an afterthought: “get food”. With an original script by Amy Dauer and music by Peter Abando, How to Adult: the musical takes into account the frustrations and privileges of typical millennials. It tells an identifiable story that you can relate to and yet laugh at, at the same time. Each character gets to sing their own song and then at the end they finish off with a remarkable medley that flows into each other perfectly while reflecting what the characters have learned. It takes a lot of nerve to sing in front of people and these young actors do so without any amplified assistance. In the end, after much arguing and emoji texting, these young 20-somethings still don’t have “it” figured out, but you do get to see them resolve their issues between each other with heart-warming forgiveness. They each mature in a different way than they planned and as a result become more adult in their interactions with each other. Funny but serious, How to Adult really strikes the proper balance a musical should have. The script is witty, emotional, and relevant, touching on some of the deeper themes of life. 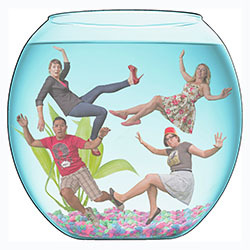 Starring Aaron Lau, Erika Babins, Natalie Moon and Jill Raymond How to Adult: the musical is sure to give you a fabulously entertaining performance. I would definitely go see this again.